Heathcare Certifications Fort Collins: Why Are So Many Healthcare Workers Needed? When it comes to job security, it’s hard to beat the healthcare industry. Those with jobs that require healthcare certifications find it easy to find a job in the first place. But they are also more likely to keep that job (thanks to a shortage of good workers) and can easily get a job elsewhere (thanks to the ubiquity of the jobs that require such skills). Plus there’s also the ability to advance as you springboard off your current healthcare courses. The US population has grown steadily since we became a country. In the last 100 years, the population of the United States has more than tripled from just over 100 million individuals to more than 328 million people today. Even as the birth rate drops in our country, hundreds of millions of people are still in need of health care each year. Healthcare training can get you into a job to help them on a daily basis. Perhaps nothing is driving the need for healthcare workers more than the Baby Boomers. The Baby Boomers came about because 16,000,000 servicemen and servicewomen returned from World War II and started families. (They were joined by people who didn’t go to war but might have delayed having children until after wartime.) This lead to 76,000,000 Baby Boomers, many of whom are still alive today. Baby Boomers tend to be between the ages of 53 and 73, and while many of them are living active lives, they are still increasingly in need of healthcare service. With the average life expectancy being about 78 years in the United States, some Baby Boomers are obviously in the last decade of their lives. But others still have 25 years or more of healthcare ahead of them, meaning those with BLS certification and Heartsaver CPR courses will be in increasing demand. This aging population will also see a huge increase in the need of those with CNA training to help in nursing homes. Until around 2016, we could have started this topic with “the United States sees people living longer every year thanks to advances in medical science.” But over the last couple of years, life expectancy has actually dropped by about 0.1 years, mostly due to increases in drug overdoses and alcohol-related deaths. Yes, despair is having a statistically significant effect on average life expectancy and is affecting thousands of people and their families. Unfortunately, many of those people are young when they die from such illnesses and early deaths. But despite the slight downtick in life expectancy, it doesn’t change the fact that life expectancy has risen dramatically over the bulk of the existence of our country. If you were a senior citizen in 1930, you’d expect to live to about age 58. Today that number is around 78. Why are so many people living longer lives? Vaccines – Thanks to vaccines, hundreds of millions of lives have been saved. Considering that 300 million people died from smallpox just in the 20th century and now the disease has been completely eradicated, it’s easy to see how vaccinations of all sorts have lead to a population boom. Sanitation – Increases in sanitation, mostly in safer water, have saved millions of lives in our country. More Mothers Survive Childbirth – While the US is shockingly bad when it comes to maternal mortality today, there’s no denying that the increases in decades-past saved many women from an early death during childbirth. Children Are Living Longer – Child mortality used to be a huge problem, with up to 30-percent of children never seeing their first birthday. Thanks to three huge advancements we detailed above — vaccines, sanitation, and nutrition — that number is approximately half-a-percent today in our country. Fewer War Deaths – Well over 1,000,000 soldiers we killed if you combine the Civil War, World War 1, and World War 2. But if you combine the next three wars, you have fewer than 100,000 deaths in Korea, Vietnam, and Iraq combined. While every war is terrible, more people are reaching old age because fewer people are involved in them. It’s important to remember that a person who survived due to any of the above isn’t just sticking around longer, but they’re often helping to increase the population as they do so. A woman who died in childbirth in World War I would have no more children. A woman giving birth after World War II and benefited from advances in medicine was more likely to survive and go on to have even more Baby Boomer children. 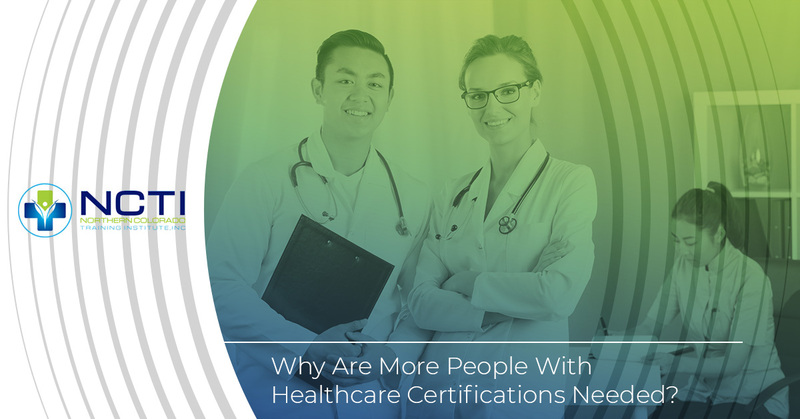 More people surviving means more people with healthcare certifications will be needed to care for them. Imagine a person is 40 years old in 1890 and is diagnosed with cancer. There’s not much doctors can do for them at the time, and they may die by age 42. But now think of a person who’s 40 years old in 1990, when there were treatment options. They might survive that cancer at age 40 and then its resurgence at age 50. The cancer never comes back, but by age 60 they have diabetes. By age 70 they need a hip replacement and are dealing with heart disease. A single person now requires exponentially more care over the decades. When a person is dead by age 40, they (obviously) never need health care again. But as people live longer, simply being around longer means that they’re going to need an increasing amount of care. They’ll need someone with BLS certification to keep them alive when they have a heart attack, and someone with CNA training to help them when they reach the nursing home. You’ve probably heard that there’s going to be a nursing shortage soon, as the average age of a nurse today is 50 years old. When they start retiring, who will replace them? We hope it’s you, and healthcare training with Northern Colorado Training Institute is an excellent first step in your medical career if you’re interested in eventually attending nursing school. The healthcare training courses at NCTI are an excellent way of entering the healthcare industry and making you a valuable part of hospitals, clinics, and nursing homes. Click here to check out our healthcare training center’s courses!